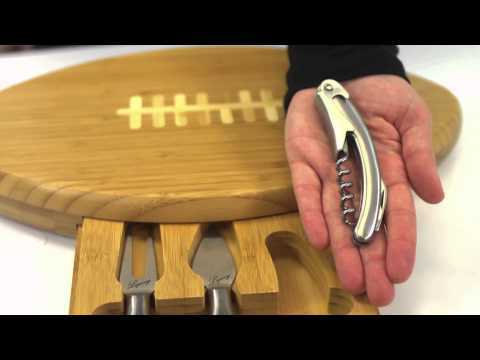 Get in the game with this all-in-one, football-shaped cutting board with wine and cheese tool set. Made from durable bamboo, this cutting board features natural anti-microbial properties that keep bacteria away. The center of the cutting board features a tray that opens to reveal a 3-piece cheese and wine tool set. All three tools are made from durable stainless steel. Each tool nestles nicely inside of the opened cutting board tray for safe keeping. Included in this cheese set is: one (1) football shaped cutting board, one (1) hard cheese knife, one (1) cheese fork, and one (1) waiter-style corkscrew. Size 8 3/4 X 15"